The above couplets written in the early days of our settlement in Bolton, which started in 1956, describe the life as it was in those days. Ibrahim Lincon of Sherpura came in 1956 as a student. Mohammed Adam Bhaijihal of Karmad came to UK in 1957 and settled in Deswbury before moving to Bolton in 1966. In 1960, came Ibrahim Little Patel, Musa Vali Patel and Haji Usman Adam of Ikher. Ahmed Musa Bajibhai of Sarnar, Isa Sarpanch of Vahalu and Yakub Bhatia of Sarod also came in 1960. In 1961 came Suleman Jiva and Yakub Natha of Dayadara and Ahmed Khoda-Dilip of Ikher. Musa Hasan of Umraj; Vali Muhammad and Dawood Chandia of Zanghar; Ismail Khenkha and Ali Chhadat of Ikher; Ahmed Hakim and Ali Thagia of Kantharia arrived in 1962. Muhammad Sufi of Manubar and Yakub Bhutawala of Tankaria came in 1963. Others to arrive in the early 1960s are Vali Patel of Dayadara, who helped people to settle in and was a community leader of sorts, and Abdul Minawala, who contributed to teaching Islam to the youth for over 20 years. In 1962 only three houses were owned by Bharuchi Vahora Patels. These belonged to Little Patel, Yakub Natha and Yusuf Bharuchi. Many newly arrived Bharuchi Vahora Patels stayed with Ismail Jamal of Dahegham as paying guests or lodgers. As their families started to come from India, they settled in Grasmere, Hibbert, Latham and Lena Streets off Blackburn Road and in Harold, Hennon, Horace and Ralph Streets off Halliwell Road. By 1980, Blackburn Road had turned into a Bharuchi Vahora Patel majority area. With the arrival of families, the need for a madrasa was felt. In 1962 the Islamic Cultural Centre was founded. A house in Walter Street, which was then occupied by Ali Seth of Ikher and Yakub Dalal of Bharuch, was bought for a madrasa in 1965. This was closed down, as there was no planning permission to use it as a madrasa. The first Juma prayer, which was attended by 20 to 25 people, was held in a house at 13 Derby Street. The first Eid prayer was offered in 1964 in the Spinners Hall on St Georges Road, led by Hafiz Adam Matadar of Valan. The first masjid in the Blackburn Road area was started in 1967 in a terraced house in Latham Street. The pioneers were Yakub Natha of Dayadara; Ahmed Hakim and Ali Thagiya of Kantharia; Vali Muhammad of Zanghar; Hafiz Adam Matadar of Valan; Ahmed Jamala of Kantharia; Isap Dada of Vahalu; and Bashir Chhadat of Ikher. This was closed down as there was no planning permission. Thereafter, a building in Canning Street, which was used as the Hesketh Mill offices, was bought and adapted for use as a masjid and madrasa. As the population increased, even this was found too small. This led to the purchase of a huge church building situated in Draycott Street, which at present houses the Taiyabah Masjid and Islamic Education Centre. In 1968, the building for Zakaria Masjid was bought in Peace Street, off Derby Street. Some of the founders were Hanif Amla, Muhammad Shafi of Kavi, Ahmed Hakim of Kantharia and Muhammad Khan. Zakaria Masjid has recently moved to a purpose built building on Derby Street. In the course of time, other masjids were founded in the Halliwell and Deane Road areas. Today there are about 15 masjids in Bolton. The foundation of Islamic education was laid by the early settlers who worked day and night in the cotton mills and donated money from their hard earned weekly wages to establish masjids and madrasas. The Islamic environment we find today is due to their sacrifices and also due to the low-paid services of the Imams and the madrasa teachers, most of whom were sponsored from India by these masjids. The hard work they put in as Imams and teachers-preachers is now paying handsome dividends. They paved the way for our present day young Ulemas and teachers who, after qualifying from the local Darul Ulooms, are now looking after the religious needs of our community in towns and cities throughout the UK. Among the prominent home-grown young Alims are Maulana Dr Mehmood Chandia, who was a lecturer at Manchester Metropolitan University and at present head of Islamic Studies at the University of Central Lancashire. Maulana Rashid Ali Sheth is the Imam at Zakaria Masjid and undertakes activities to increase the awareness of Islam among the non-Muslims in Bolton. Mufti Fayyaz Ismail Dayrava has been rendering remarkable services as the Imam of Taiyabah Masjid. Maulana Farooq Ismail Samniwala is actively involved in Islamic activities in Bolton. He has been a governor of the Valley Primary school for 22 years and a Muslim Chaplain at the Royal Bolton Hospital for 21 years. 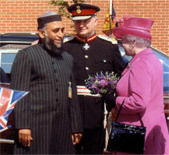 In recognition of his community services, he was honoured with an invitation to meet the Queen when she visited Bolton in 2009. Maulana Iqbal Samniwala has been the Imam at Masjid-e-Noorul-Islam since the early 1980s and has given outstanding service to the early settlers on Blackburn Road. His sons, Maulana Hussein and Maulana Kalim are also Alims (Islamic Scholars) and have been doing outstanding work with young Muslims. Initially, Bharuchi Vahora Patels of Bolton were textile mill workers. Usman Haji of Ikher opened the first grocery shop in Charles Rupert Street. Mohammed Adam Bhaijihal of Karmad started the first Asian grocery shop on Blackburn Road and his sons were the first Vahora Patels to go into the petrol station business in 1984. Slowly Bharuchi Vahora Patels started their own businesses. Dilaver Vali of Dasan, Jiva Brothers of Dayadara, Abdur Razzak Munshi of Nabipur, Fazal Bhutawala of Tankaria, Munshi Brothers of Sarod and German Brothers of Valan started their own garment and curtain manufacturing factories. Yakub Accountant and his brother Anwar Ibrahim originally from Maakan, near Palej, own the Cohens chain of Chemists in Lancashire. They are the most successful Bharuchi Vahora Patel businessmen in the North West of England. They have generously contributed to such local community projects as the Bolton Muslim Girls School and the building of the new Zakaria Masjid. Iqbal Bhutawala runs Asif Iqbal Pharmacy Ltd on St Helens Road. Riaz Vali runs an on-line pharmacy called NATCOL. Dilaver Vali and Mustak Vali of Dasan have their own factories making garments and nan-bread. Dilaver Vali is a committed person who loves community work and wants to see his community becoming more educated and prosperous. He is a founder member of Bolton Muslim Girls High School and one of the founders of the well-known Munshi Manubarwala Educational Complex in Bharuch. Ahmed Patel of Kamboli runs the Aleef chain of newsagent’s shops and petrol stations. Ibrahim Dalal of Kantharia has a large poultry business. Adam Dawda of Zanghar runs a wholesale business of motor spare parts. He too is involved in social welfare activities. Hanifbhai and sons of Kantharia run Barakat Cash and Carry on Derby Street and in Preston. Yakub Zangharwala and Sons run Draycott Street Cash and Carry, mainly selling Asian grocery. Apart from these, many Bharuchi Vahora Patels own chemist, grocery, newsagent and optician shops. Some are running garages, petrol stations and taxi firms. Some others are working as postal officers and drivers in the Royal Mail, while others run their own sub Post Offices. Considering the population, very few Bharuchi Vahora Patels have found jobs in the Town Hall or Government departments. 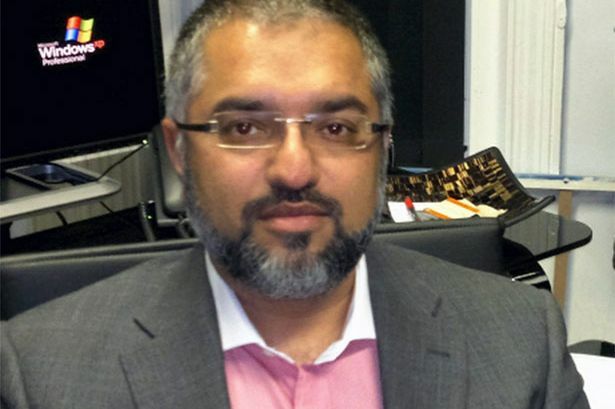 Of the few who have, Muhammad Iqbal Essa is HM Principal Specialist Inspector at the Health and Safety Executive in Manchester. Being a JP, he also performs his duties as a Magistrate. Yasmin Umarji was honoured with the Bolton Diversity Award in 2005. She was Chairperson of the Asian Resource Centre for ten years. At present she is Senior Area Achievement Officer in the Education Department at Bradford. Yasmin Ali, daughter of Yakub Bapuji of Tankaria is a Commercial Relationship Manager at Lloyds TSB Bank. There are highly qualified Bharuchi Vahora Patel professionals working as accountants; chemical, civil and computer engineers; dentists; doctors; pharmacists; solicitors; and teachers. 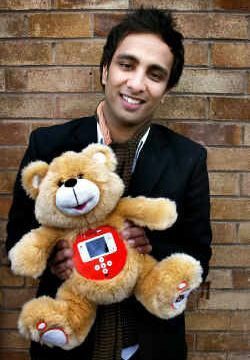 Imran Ismail Hakim of Kantharia has earned a nation-wide reputation as a star of the BBC’s Dragon’s Den, Innovator and Young Entrepreneur and also as an Ambassador for Enterprise and Innovation for his invention of the iTeddy. There are many Bharuchi Vahora Patel doctors in Bolton. Among them are Farzana Sharif Thagia of Tankaria; Salim Ibrahim Natha (ophthalmic surgeon), Liyaqat Ibrahim Natha and Maqsood Ibrahim Natha of Dayadara; Abdur-Rauf Munshi, Sarfaraz Munshi, Arif Munshi, Ismail Gulam Vadiwala and Surayya Gulam Vadiwala of Nabipur; Javed Buksh of Kamboli; Farhana and Sumayya (paediatric registrar) Dilaver Vali of Dasan; Nargis and Zainulabedin Siraj Patel of Paguthan; Noorjahan Vali Sagir, Rehana Ali (gynaecologist), Zaheda A Gafoor of Kothi-Vantarsa and Talha Ilyas Patel. Shamim Adam of Tankaria is a registered homeopath. Firoza Ismail Jiva is a well-known dentist. Dr Muhammad Jiva, son of Ismail Jiva of Dayadara, was awarded an MBE in 2014 for his unique services to General Practice. In 2008 he opened the UK’s first GP practice based at a supermarket. Dr Jiva is also behind a £500,000 GP extended hours pilot scheme. Ismail Tailor of Achhod, Salim Bangalawala of Tankaria, Anis and Arif Abdul Khoda of Ikher are pharmacists. Atiqa Dilaver Vali of Dasan; Hasan Jiva, Ashiq Husein Patel and Nasiruddin Patel of Dayadara; Councillor Asif Ibrahim of Pariej; Yusuf Hafiz Yakub Maka of Sitpon; Hazra Yakub Khoda of Tankaria; and Tazim Iqbal Amdavadi are solicitors. Habibunnisa Gulam of Nabipur obtained a Degree in Law from the University of Cambridge and practises as a corporate lawyer in London. 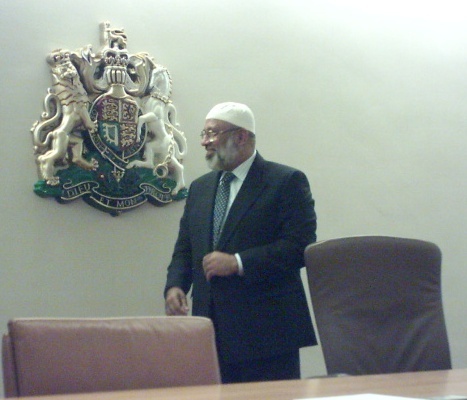 Ishaq Hafiz Yakub Maka of Sitpon is a barrister in London. Bilkis Bashir-Ismail of Ikher qualified as a barrister and a chartered tax advisor. She worked as a researcher for Bolton North East MP, David Crausby, for a period in 1998 and again between 2003 and 2004. She has also worked for KPMG from 1998 to 2002 and as a civil servant in London from 2003, before starting to work with a law firm in 2007, which sent her to Dubai in 2009. Some young Bharuchi Vahora Patels run their own design and printing, website design and estate agency businesses, while some others own grocery shops, take aways and taxi firms. The Bharuchi Vahora Patels of Bolton have created many Islamic and social institutions. There are a total of nine masjids and madrasas under Bharuchi Vahora Patel management. Bharuchi Vahora Patels took the lead and made huge contributions, both physical and financial, in the establishment of the first Darul Uloom in Ramsbottom, Bury. In the forefront were Ismail Taylor, Yakub and Adam Mogra, Yakub Bhatia, Dilaver Vali, Bashir Chhadat, Ismail Khenkha and others. Darul Uloom Bolton was founded with the inspiration and duaa (prayers) of Mufti Saeed Ahmed Palanpuri, Shaikh-ul-Hadith, at the world renowned Darul Uloom Deoband. Initially, the pioneers were Qari Ismail Samniwala, Qari Yakub Nanji, Dilaver Vali and Adam Rokad who were joined by Muhammad Munshi, Yusuf Bhailok, Arif Vaza and Ayyub Matliwala. This Darul Uloom campus is now located in Willows Lane and includes a High School and Sixth Form College. Bolton Muslim Girls’ High School was founded in 1987. The founders, to name a few, were Dilaver Vali of Dasan, Adam Rokad of Valan, Yakub Musa of Karmad, Ibrahim Natha of Dayadara, Ahmed Kamboliwala, Vali Diveli of Valan, Yakub Bhutawala of Tankaria, Gulam Nabipuri and others. The School started with only 23 girls paying just a nominal tuition fee. It is now state funded with a strength of over 600 girls. In its early days, Yacoob Mank gave his services as an administrator while Hasan Issat was the first head teacher, followed by Dr Adam Ghodiwala and Mubaaruck Ibrahim. At present Idrish Patel is the head teacher of the school. Yakub Patel of Cohens Chemists and Adam Dawda efficiently run Essa Academy in Bolton. There are some Community Centres managed by Bharuchi Vahora Patels, but apart from wedding ceremonies and wedding dinners, regrettably no other social or cultural activities are taking place at these centres on a regular basis. There are some private wedding halls also serving the need of the community. Bharuchi Vahora Patels were in the forefront of the creation of the Bolton Council of Mosques (BCoM). Maulana Muhammad Adam Rokad gave his services as the Chairman and Secretary of BCoM for almost nine years. The organization made remarkable progress during his tenure. His efforts resulted in an MRI scan facility for Muslim dead bodies, which can be used instead of a post-mortem. He also made a remarkable contribution to community cohesion in Bolton. He is now teaching at Darul Uloom, Bolton. Another organization is the Asian Elders Resource Centre which is a specialized service provider for older Asian people living within Bolton Borough. Bharuchi Vahora Patels have been actively involved in its activities since its inception. Anis Haroon Patel is the present Chairman of this organization. 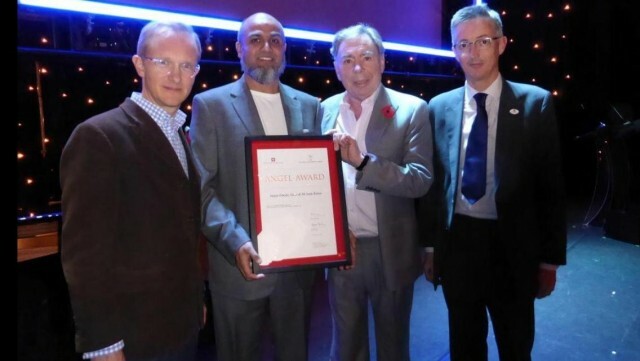 Inayat Omarji (Buchya) received English Heritage Angel Award in 2014 for the role he played in the renovation of the disused All Souls Church in Astley Street, Bolton,and an MBE from Prince Charles in 2016 in recognition of his work in Bolton on a number of major community initiatives. Muhammad Hanif Ali runs Hibbert Street Community Centre, organizing various training programmes, social events and activities for the women and young people of the area. Political awareness is increasing among Bharuchi Vahora Patels in Bolton. The late Sufrana Bashir-Ismail was the first Muslim woman councillor. She has now been replaced by her sister Barrister Bilkis Bashir-Ismail as a Labour Councillor for the Crompton Ward of Bolton. She is a valued member of the Crompton Team, giving her time generously to the residents of Crompton. The late Vali Bux of Pariej, Muhammad Hanif Ali of Ikher and Iqbal Patel were also local councillors. Idris Ali Sheth is an active member of the Labour party. He played a major role in obtaining state funding for Bolton Muslim Girls School. Bolton is the main hub of Gujarati literary activities in Britain. The very first Gujarati Mushaira (poetry reading) in the history of the UK was held in the Spinners Hall, Bolton in 1966 in honour of the internationally renowned visiting poet “Bekar” of the Bharuch District. Other poets who were present and took part in this historical Gujarati Mushaira were Kadam Tankarvi, Mahek Tankarvi, Sufi Manubari and Anjum Valodi. In 1970 the Gujarati Sahitya Mandal (Literary Organization) was founded at Kadam Tankarvi’s residence in Preston. Mahek Tankarvi and Sufi Manubari were its founder members. In 1973 the famous Gujarati poet Shekhadam Abuwala visited Britain from Germany and he renamed the Gujarati Sahitya Mandal to the Gujarati Writers Guild, UK. At present, Mahek Tankarvi of Bolton is its President and Siraj Patel “Paguthanvi” is its Secretary. The other Gujarati poets in Bolton are Dr Adam Tankarvi, Sufi Manubari, Haroon Kothikar and Pathik Sitponvi. These poets organise annual mushairas and also take part in the mushaira events held in other parts of Britain. Adam Tankarvi is a well-known poet and writer. Besides some books, he has also published eight collections of ghazals and poems. In August 2011, he was honoured with the very prestigious Kalapi Award by the Indian National Theatre in Mumbai, India. 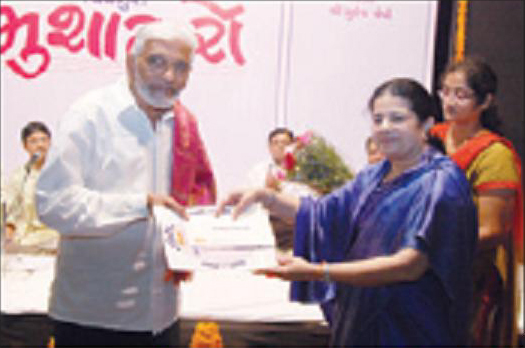 He is the first and only Bharuchi Vahora Patel to receive such a honour in the field of Gujarati poetry and literature. He has been invited to participate in international Mushairas in Canada, Muscat, Sharjah and the USA and his poetic creations have always been acclaimed. In the words of the historian Makrand Maheta, the Bharuchi Vahora Patels’ contribution in the preservation and development of the Gujarati language and literature here in Britain is very remarkable indeed! Farook Ughradar, son of Aziz Tankarvi, has established his own printing enterprise, Hot Print Design, and publishes an ethnic minority community news magazine called “BritAsian”. In 1995, when Radio Bolton was launched, Siraj Patel “Paguthanvi”, having 20 years’ experience working for the BBC, was appointed to be the presenter and producer of the Asian programme. Besides literature, Sufi Manubari and Yakub Zangharvi have an interest in art and paintings. As amateur painters, they have produced some landscape and modern art paintings. Sufi Manubari has produced some 20 landscape paintings whereas Yakub Zangharvi has produced about 40 such paintings. During a visit to India in 2011, he visited Delhi where he presented one of these paintings to the All India Congress President Sonia Gandhi and the other, with an artistic portrayal of the map of India, to the President of India Pratibha Patil. The favourite games of the Bharuchi Vahora Patel youth in Bolton are cricket and football. There are quite a few Bharuchi Vahora Patel cricket teams and, every year, tournaments are organised during the summer time. The winning teams and individual players are awarded trophies in the annual programmes held specially for this purpose. Many of our teams play in the Bolton Association. However, these teams have not yet found a place in the well-known Deane and Derby Cricket Club due to one reason or the other. 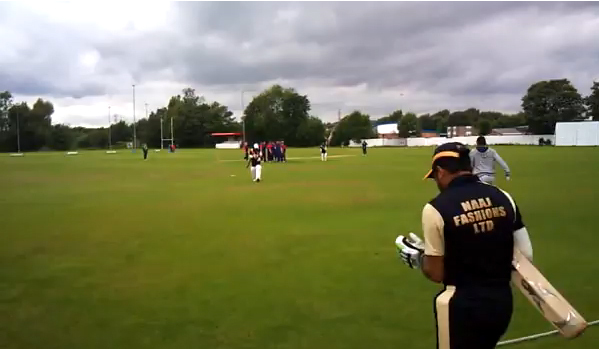 Inayat Pirbhai of Karmad acts as an umpire in the Bolton League cricket matches.